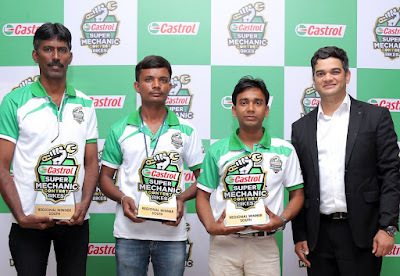 Ravish S, Ratan Khanda and JP Rajakumar emerged on top in the closely contested Castrol Super Mechanic regional semi-final for bike mechanics held in Bangalore. The winning trio will be competing with 21 other champion mechanics representing seven other regional semi-final winners for the coveted title of Castrol Bike Super Mechanic. The three national winners will represent India at the Castrol Asia Pacific Bikes Super Mechanic contest to be held in Thailand in November 2018. The Bangalore regional semi- final event witnessed keen contest by over 180 qualifying mechanics selected from the one lakh mechanics who had registered to participate from across the country. The regional qualifiers competed in theory and practical rounds, which tested their skills and knowledge about two-wheelers as well as lubricants. The participants also attended a training session on bike repair and maintenance. One of the highlights of this year’s event was the interaction between mechanics who had already participated in last year’s event, sharing their experience and tips with the first time participants. The All India finals of the Castrol Super Mechanic Contest will be held in Mumbai with the national winners representing India at the Asia & Pacific Castrol Bike Super Mechanic contest.